Tonight, we will be able to see the most spectacular supermoon since 1948, appearing 14 per cent bigger and 30 per cent brighter than usual. It’s because the moon will be coming closer to Earth than it has done for 69 years. Not 100% sure whether there is a connection but earlier in the day, before the superman was to appear, Pádraig’s good friends finished the sensory garden features. 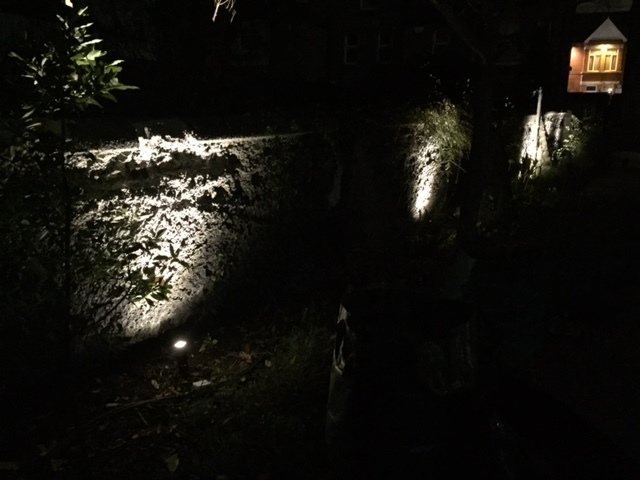 Maybe just in case tonight’s clouds would cover the sky and hide away the supermoon they installed lights (which you can see on the picture) and added some soothing sounds of water splashing down on the stone (don’t think you can see that on the picture). There are a few finishing touches to be done but it looks like Pádraig’s new garden is nearing completion. It’s feeling, looking, and sounding pretty amazing. We were preparing today for Pádraig’s first trip to a swimming pool after the accident tomorrow afternoon. It’ll be a really exciting day. One of those I thought would never come.